The latest Resin Car Works kit! Resin Car Works announces their second freight car kit, an Illinois Central, Enterprise design, 33-foot, offset-side, twin hopper. From 1937 to 1949, 12,000 of these offset-side twin hoppers were manufactured for the Illinois Central by a variety of builders, including the railroad itself. 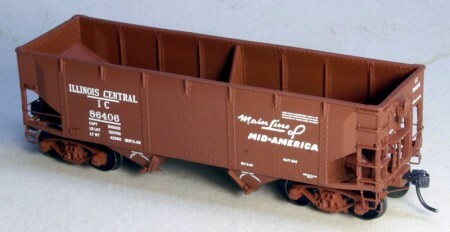 These are fleet builder kits with cast on grab irons to minimize the time and effort to get these models into service on your railroad. The kits are $36, plus shipping. Trucks and couplers are not included. A United States Army version is also available. Visit the Resin Car Works website for more details. These cars were everywhere in the Midwest for many decades. The model is beautiful and the decals are excellent. Thanks Frank for keeping us well-supplied with essential freight cars. And on a personal note, thanks Frank for helping me out with my old Sunshine IC hopper. I’ll try and post a photo here if I can.